I got up here and took one picture and my camera died. I thought the battery might need recharging, but that wasn't the problem. The lens won't retract, it won't turn on or off in picture mode. It will allow me to see the pictures already taken, but I have since downloaded them. I wonder if it was dropping it in the sand last week..... But then I wanted a new camera anyway. But the biggest issue is my computer. I thought the hard drive seemed to be cranking and cranking and cranking the other day. In fact, I thought about it and realized it's been doing this for several weeks. My battery won't stay charged either. If I am not plugged in, I have exactly 19 minutes before it shuts down. But today it wouldn't boot up. Finally after trying safe mode, last known configuration, etc., etc., it did boot, but then I could not open my mail program with my contacts and calendar. Oh my, my life is ruined. Without those, I don't know anything. Every phone number and address and email, including over 6000 emails and 400 contacts were in that program. So I did what every network tech does, I rebooted. And it took about an hour to get it to boot up again. So I checked the event log and my hard drive has a bad sector. What is that you say? Well, believe me, it isn't good. After leaving the campground at Death Valley, I headed south towards Badwater. It is the lowest point in North America at about 230 ft. below sea leavel. It is called badwater, not because the water is poison, but because it is salty, and such, is bad to drink. It is only 3 miles across the salt flats, but there have been deaths from people who are not prepared and don't carry enough water and some sort of hat or shade for their head. Temps can get above 130 degrees in the summer. I'm glad I was here in the fall. Here I am at Baker, CA, just on the edge of the Mojave desert. We stayed overnight in a lot across from a Big Boy's Restaurant. But Baker is known for having the largest themometer in the world. As you can see, it is pretty large. On we headed through the Mojave towards I-40. Halfway we stopped at Kelso. Once it was a thriving train station and town of 1500 population. Now it is has been restored and is the parks visitor center. No more passenger trains, only freight trains go through daily. I was lucky enough to be outside when a freight train went zipping by. It doesn't even slow down, just blows its whistle. My next stop was Parker, AZ, where I met up with the WINs again. They were staying at a county park, right on the river. It was beautiful, especially during the sunsets. Above is just one of the beautiful sunsets I saw while there. Of course, anytime we are near a river we go kayaking. So one day we put in right where we were parked and kayaked down the Colorado River about 7 miles to Bluewater Casino. We arrived just in time for the casino's buffet lunch. But on the way we detoured through some canals and I thought the above sign was too much. One day I headed back to Lake Havasu City, where the famous London Bridge was reerected. A local townsman throught the town needed something to draw the tourists. It just so happened that London, England, was looking to sell one of their bridges. So the city purchased the bridge for 4 million dollars and spent more than that reerecting the bridge. But I'm sure it has paid back the city many times over in revenue from the tourists who flock to Lake Havasu City just to see the bridge. Like me.. Here is a larger picture of the entire bridge. At the time they erected the bridge there was no water underneath. After the bridge was built they dredged a canal under the bridge and allowed water from the Colorado River to flow in. I didn't kayak the Bill Williams River, although some of the group did, but I did stop and hike the area. It is a marshy area and great birding area. 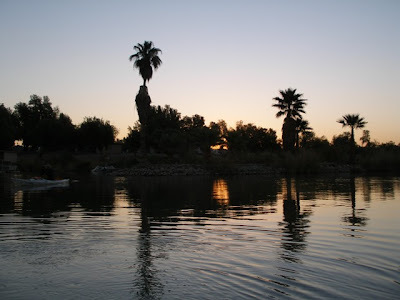 After Parker, AZ, I moved down to Blythe, CA, on the other side of the Colorado River. While there, some of us ventured out to Cibola National Wildlife Refuge. After having the ranger interns show us a film at the visitor center, they took us on a guided tour of the area. We saw lots of Sand Hill Cranes and heard just how loud they can be. Another place we visited was the Blythe Intaglios. As you can read, they are giant figures made on the desert floor. I wasn't sure what that meant exactly, but in the next few pictures you will see. I wasn't exactly impressed. Here is what they are supposed to look like from the air. They were discovered in the 1930s by a pilot. I couldn't get a great shot, but this is what you see from the ground. I know I have some more catching up to do about where I went after Death Valley, but, this is more exciting. I became a grandma, for the 6th time, Tuesday evening. Now I had 5 boys and 5 grandsons, so when this little girl was born, it was something special. She was 18 1/2 in. long, and 5 lb. 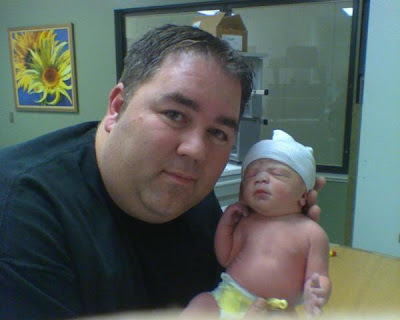 15 oz, named Caitlin Jean Patton. I am so proud, but then, I think daddy is too. Caitlin with dady, just a few hours old. After leaving Golden Shores, I headed towards California's Death Valley. It was the time of year for the 49ers Encampment. Didn't really know what it was all about, but had heard it was something to see. So I went. Back up through Las Vegas, then west through Pahrump, before heading down into Death Valley. Now Death Valley is known for several things, such as: the old western TV show, Death Valley Days; 20 Mule Team Borax for cleaning; being the lowest point in the Western Hemisphere; and for the 49ers, those illustrious pioneers who crossed in 1849 headed for the gold fields of California. The 49ers Encampment is a celebration of the 49ers, complete with a wagon train and riders who arrive in the middle of the celebration. Don't know exactly how far the wagon train came, but talking to some of the riders, they rode for 6 days, and 130 miles to arrive at Death Valley. 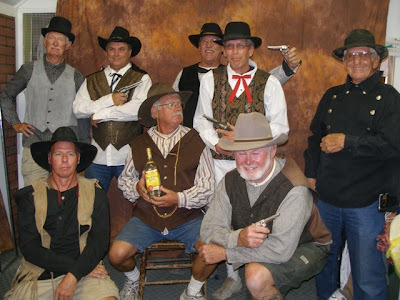 Along with the Encampment is lots of cowboy music, cowboy poetry, cowboy artists, a gem and crafts show and films about Death Valley. 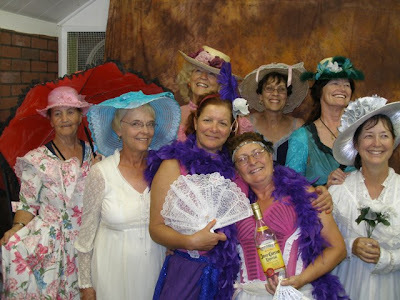 There were fiddlin' contests, pickin' contests and even a parade. But there was also time to sightsee as well. 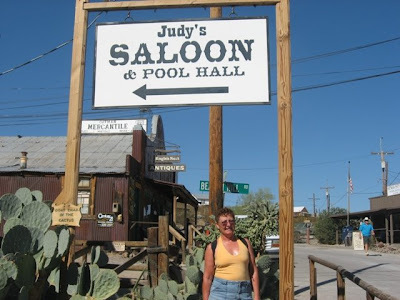 One day a group of us took off for Titus Canyon and along they way stopped at the old ghost town of Rhyolite. But what I thought was most intersting was about borax. I had only heard of this mineral in the 20 Mule Team Borax or now known as Borateem. It is a cleaning agent and laundry booster. But in the museum I learned that only 5% of all borax is used in cleaning products. Most of it is used in the making of fiberglass and pottery glazes, as well as some other industrial uses. All in all, I had a great time. Glad I went. Will go again. Did not get to see all that there was to see of Death Valley, so I have things to look forward too when I return. Here are some memories of my trip. 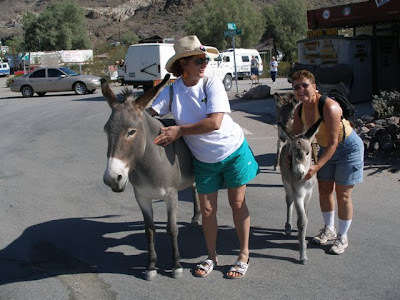 Outside of Furnace Creek Ranch, across from the campground. The old train depot at Rhyolite. The mining town lasted only three years from about 1903-1906 with a top population of 10,000, but by the 1920s had only 20 people left. The group who went to Titus Canyon. Looking across one of the intersecting valley while driving through the canyon. Back at Furnace Creek in the Date Palms. The wagon train coming in. Snowcapped mountains surrounding Death Valley. We had a storm the last night there with winds up to 50 mph and some rain, which was snow in the higher elevations. 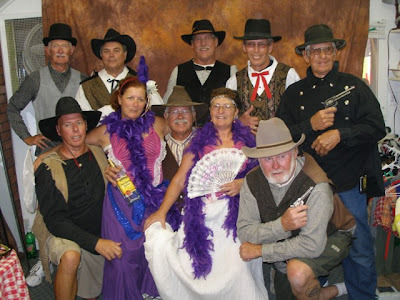 I did a sunrise kayak, visited a touristy ghost town and dressed up for old time pictures, did a 4-wheel ride and kayaked Topock Gorge as well as dressed up for a costume Halloween party while staying at 5-mile Landing, Havasu National Recreation Area, Golden Shores, AZ. Bertie's blown tire on our 4-wheel trip. Sandy getting a free ride down the river. Water fights on the river in Topock Gorge. Dancing at the Halloween party, I'm a tigress. I always seem to have a saloon or cafe in these small towns. The showgirls with the guys. The guys all dressed up.